I’ve studied my opponent’s strengths and weaknesses and after hours of trial and error I finally have a foolproof plan. I have my health gourds on max and enough spirit emblems to utilize whichever attacks I see fit, my sugars are stocked and nothing can stop me. Now is my moment to shine and I shall not fail! Death. This is the next word I see. I have fallen once again at the hands of the enemy, not because of any in game hi-jinks, but because this game is hard and my go-to attack strategy in the heat of the moment is “PANIC”. This difficulty is of course to be expected coming from director Hidetaka Miyazaki best know for his work with From Software on both the Souls series and the more recent Bloodborne. 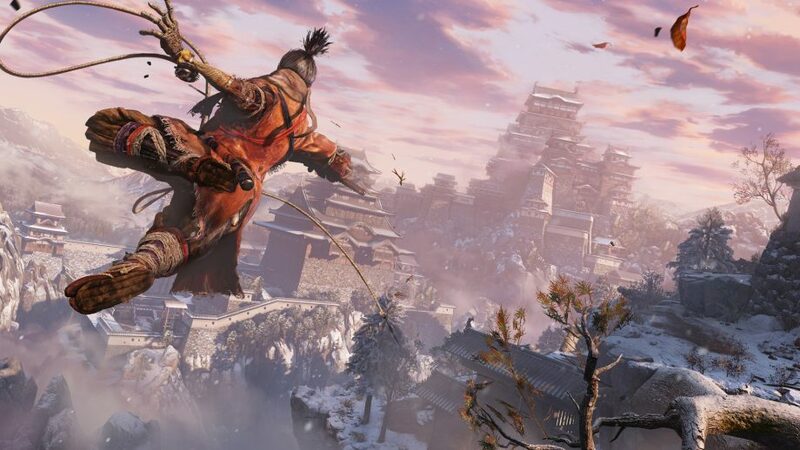 Sekiro, like those From Software games that came before it, is an absolutely brutal game tasking you with vanquishing unbelievably daunting enemies with little more than a sword and your fingers’ ability to move across a controller. Well that isn’t entirely true as you do have a couple more bits and pieces to help you navigate the perilous world of Japan during its notoriously violent Sengoku period. You play as the titular hero Sekiro, a shinobi tasked with protecting the Divine air Kuro; and whilst I don’t want to spoil anything (although the name Sekiro gives it away if you speak Japanese), very early on you lose not only your protectee but your arm as well. This leads into you getting a fancy shinobi prosthetic arm, that you’ve no doubt seen in the trailers for the game, an integral part of the combat and exploration. Your shinobi prosthetic starts as merely a normal arm of rusted iron and wood but slowly grows with every new attachment you find and have grafted onto you until you’ll be running through battles sprinkling firecrackers into Samurai’s faces and trying to figure out exactly when is a good time to unleash your loaded umbrella as a shield. You’ll also be using your prosthetic to shoot out a long reaching grappling hook so you can get yourself up onto the even the highest of roofs so you can survey your scene and figure out exactly how to sneak attack every last thing on the battlefield…just like a true ninja. You’re also gifted with a wealth of up-gradable skills from passive abilities such as being able to sneak without getting spotted as easily and new and exciting sword techniques such as the stoic Ichimonji looking like it was straight up lifted from the 1954 classic Seven Samurai and doing so much posture damage it kind of makes you feel bad for your opponent….kind of. Now if you take anything away from that previous statement it should be the word “posture” as that’s going to be the key aspect to combat if you want to make it through any of Sekiro’s fights without pulling your own teeth out in frustration. The game does have health and sometimes you can smash through an enemy’s life force to get that sweet sweet kill but a lot of the time it not only easier to break their posture but in some cases, especially with bosses and mini bosses, breaking posture is the only way you’re going to beat them. You break posture by successfully deflecting an enemy’s attacks whilst simultaneously landing strikes against them. Every time they have to block you or you deflect or you take them off balance with a well placed attack as they attack all adds to their posture meter raising and the chance of their posture breaking raising with it. Once the posture is completely broken you have the chance to land a savage deathblow attack and end what was probably a gruelling and intense battle. Now if any of that sounded hard, and it should do, its because it is hard. I don’t think I can explain just how difficult this game truly is, but just know that not only does this game ask you to use practically every button on the controller during combat but it does it whilst expecting you to remember specific character weaknesses as well as all their different methods of attack and in what rhythm they come at you so you can block, parry, dodge or just absolutely leg it out of the way. The game is brutally hard but, as with most things in life, the sense of accomplishment is far greater because of said difficulty…unless of course you figure out a tried and true cheesing technique and get them stuck in the scenery whilst you whack away. 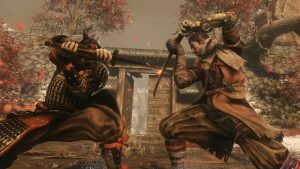 There is more to Sekiro: Shadows Die Twice but I’d be doing it a disservice if I tried to explain all the other subtle nuances of combat and stealth so I’ll just leave you with the fact that if you’ve ever been a fan of Bushido Blade, Tenchu, Ninja Gaiden, Dark Souls, Bloodborne or just like tormenting yourself with the prospect of hours and hours of ultra hard combat that’ll make you eyes bleed, then this is for you.